As you can see from the photo above, my cold weather crops are growing beautifully. 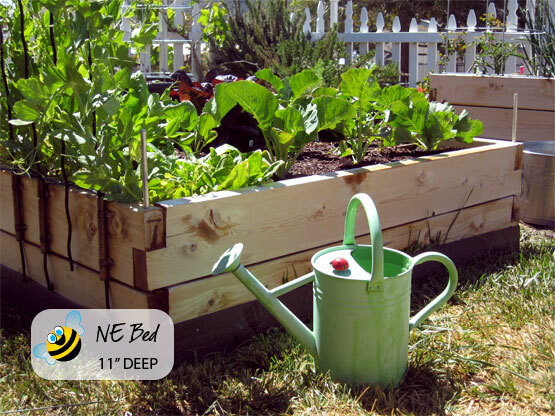 Things like broccoli, cabbage, cauliflower, lettuce and peas are more than happy with a chill in the air. But this week is showing signs that Spring may have finally arrived, with Summer just around the corner. So I spent a beautiful few hours in the garden this morning, focused on my warm weather crops. are the Super Sweet 100 and Yellow Pear Tomato that I started from seed indoors. Again, these replaced the same plants that were already outside. Peppers: My sweet bell peppers that started indoors have experienced very slow growth. As an experiment, I planted a few seedlings outdoors. They have suffered with wilted leaves, and something muching on them. They are doing worse than the little guys still growing indoors. Worried that I’ll never get any peppers, I recently purchased a Sun Bell and Bell Purple plant, and put them in the garden today, along with a Thai Dragon pepper for when I’m feeling spicy! As for my little peppers started from seed, I’m trying to slowly harden them off, and will plant them once they get another set of true leaves. (Currently, they only have 4.) Let’s hope that my seedlings make it through, and one of them turns out to be orange. My favorite. 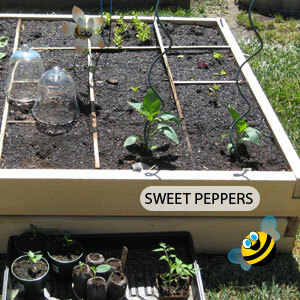 The photo shows my newest purchased peppers planted, bottom right. The two squares behind those contain the suffering peppers that were planted a few weeks ago. In the tray in the foreground, you can see the indoor seedlings spending the day in the sunshine. 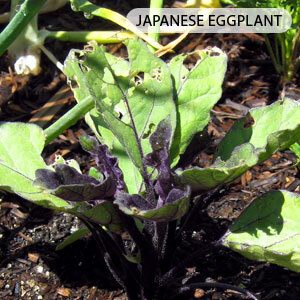 Eggplant: The Black Beauty eggplants started from seed have suffered a similar fate as the peppers; very slow growth. I stuck my only two seedlings directly in the garden a few weeks ago. Why, you ask? Well, I figured they weren’t happy inside, so they might prefer outside. I hardened them off for a few days, and put them into the ground when it looked like Spring had actually arrived. Of course, I was wrong about the weather, but these plants started suffering prior to winter’s untimely return. Only one eggplant made it through, so I have him and a purchased transplant of Japanese Long Eggplant. The photo shows my Japanese Eggplant. Somebody thinks this plant is mighty tasty. Any idea what it might be?